"Of all the services WJCT provides, nothing surpasses our commitment to our most precious resource. WJCT is committed to promoting joyfun learning and empowering children to succees in school and in life." 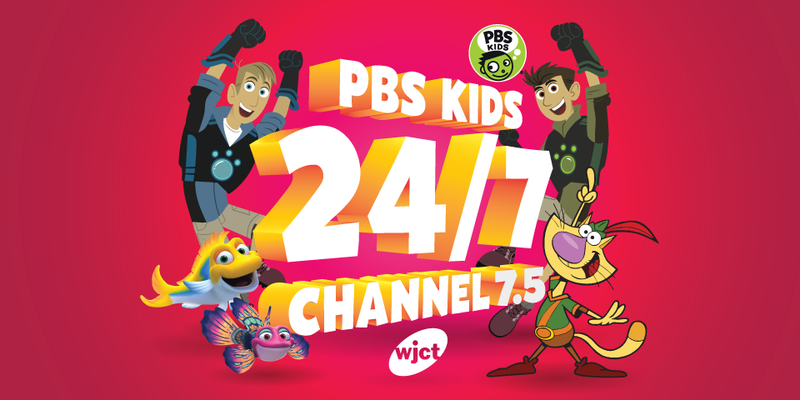 Each week, WJCT-TV provides a safe haven of engaging, educational PBS Kids programming and online content of the highest quality. The programs are non-violent, commercial-free and age appropriate, offering positive role models for kids to learn from and grow with. PBS Kids characters emulate good behavior toward one another and demonstrate respect and tolerance toward family members, peers and others. The programs reflect a diverse audience, and are available free to families of all income levels. Our commitment goes far beyond television, encompassing Ready To Learn, WJCT’s Writers Contest, and other initiatives that put educational tools directly in the hands of parents and caregivers. We are a trusted classroom resource, providing free lesson plans, teachers’ guides and online activities for K-12 educators. Assisting parents, caregivers and educators in countless ways, to help kids succeed. Coming soon to PBS Kids: Let’s Go Luna! Where in the world will they go next? LET’S GO LUNA! follow the hilarious adventures of three friends – Leo, a wombat from Australia; Carmen, a butterfly from Mexico; and Andy, a frog from the U.S. – as they traverse the globe with their parents’ travelling performance troupe, “Circo Fabuloso.” At each of the Circo’s stops, Luna the Moon guides the trio as they get to know the local region and its people. Premieres November 21st, 2019 on WJCT’s 24/7 Kids Channel 7.3 (Comcast 211). For more about LET’S GO LUNA, all her friends, and other PBS characters click the button below. Now there’s even more PBS Kids to love! Tune in to channel 7.5 via antenna and catch even more of your favorite shows anytime you want all day long. Comcast channel details coming soon! American Graduate is a public-supported media initiative, supported by the Corporation for Public Broadcasting (CPB), to help students stay on the path to on-time high school graduation and future success. Prevent the “summer slide” with these great resources from WJCT and PBS! A wealth of free classroom-ready education assets from across a wide variety of grade levels, subjects and standards. PBS Parents is a trusted resource filled with information on child development and early learning, and offers access to educational games and activities inspired by PBS KIDS programs. PBS’s award-winning television combined with community outreach efforts to build children’s learning skills. See if your school participates and find out more! Teaching U.S. history through free, fun and interactive games! A 5-day camp allowing children 6-9 years old to step into the shoes of Odd Squad agents to solve and report a series of odd cases as they engage in interactive content, games and crafts.